← Were you lead to believe you have a Mild Traumatic Brain Injury mTBI? Maybe or maybe not? This letter was written in 1993, a little over a year after my injury. This letter details not only what was happening to me shortly after brain injury, but what was happening inside the healthcare system. The information is accurate and correct as supported by documentation. It has been retyped, but no other revisions exist. This will help provide the reader to understand what has been happening in our healthcare system. 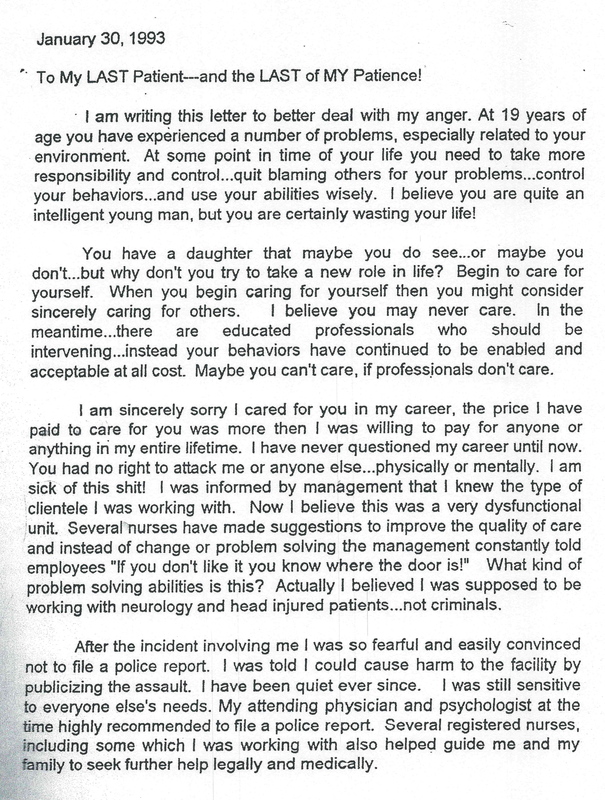 This is how the nurse that was assaulted perceives the assailant-patient and his situation. She also points out many issues within this specific head injury and neurology acute rehabilitation unit at a prestigious rehabilitation center in northeast Ohio. You will also understand what the healthcare workers endure on a daily basis on this unit. This article written shortly after injury identifies many flaws in our healthcare system, most importantly safety. Thank you do much for sharing this deep sadness and intense experience you went through. It was so moving. I’m so sorry that it happened to you. You mentioned that the perpetrator is locked up in some way. I hope you’re right. But even if he isn’t, he will pay for that in a karmic way. People who do things like that always do. It sounds to me as though his life is payment enough. On the other hand, your life has catapulted forward in a positive way; I can tell just from reading your blog. That’s great. Congratulations. No protocol for this containment (right word?) room and its inmates. 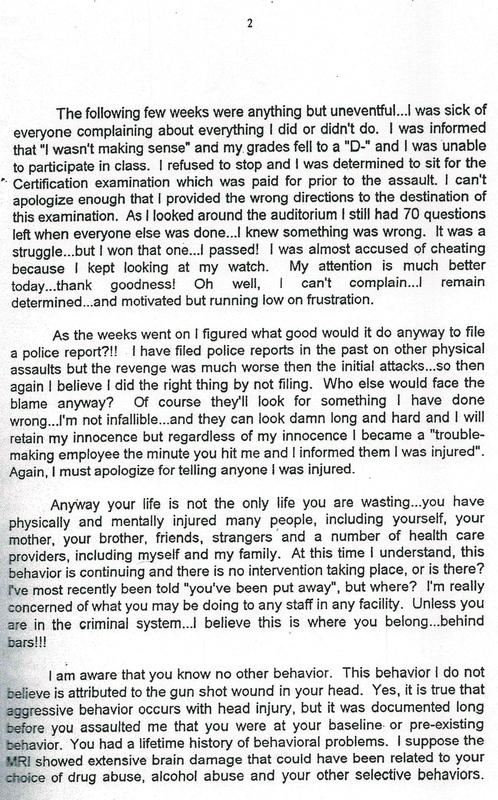 The fact that you were not supported and helped afterward by the administrators of the place where you were assaulted. Also that your peers, the other nurses, had been trying to get things changed to prevent such a thing happening for a while — but no one listened and did anything to change things. There is much more. I can’t imagine how it must have been for you. The workplace can be a jungle full of predators and snakes. I’m so glad that your family supported you!! Almost always, when we walk through trouble it is for the first time, and so we must learn along the way and that can be so tough. Yes, they must have their eyes closed to think their perfect. We’re so far from that, we humans! Eyes closed while walking could be dangerous! In a sense, Edie, you’re sailing uncharted waters. God bless you as you work! It’s interesting the attitude of acceptance that many health care settings have about violent behavior. You were working with brain injured, not criminals. People need accountability for their actions. It may be trickier with brain injury because it can impact impulse control. But, without boundaries, there’s no motivation to work toward improvement. I work at a VA. The majority of the Veterans are non-violent. They’re good people. However, there are some who can be violent. I remember taking a lot of verbal abuse while working in Suicide Prevention. The vets were in “crisis” which limited the amount of boundary setting I was able to do. If a Veteran has a history of violence or threats, we still have to provide services. The VA Police are called to standby while the veteran is on campus. In a way, we accept the threat of violence. I think it’s wrong. People shouldn’t be worried about safety at work. Violence and threats shouldn’t be tolerated. I appreciate your input and thank you so much for helping our Veterans. It is true that working with brain injury does mean a loss of impulse control and a certain level of abuse will occur. Unfortunately, when it’s repeated and deliberate behaviors… boundaries need to be set, and instead the behavior is accepted. No one should expect to be calling security several times a day for one person. When security is threatened, how do they think healthcare employees are dealing with the situation? They are not dealing with it at all. We need to stop this abuse, and not just accept it! It’s also understandable “crisis” escalates behaviors…it doesn’t mean accept violence! You are right, the majority of people are excellent. They also suffer when their safety is jeopardized. Fear can be very traumatizing to patients. Safety, safety, safety for everyone. Violence should never be accepted. Take care and stay safe. What bothers me is it’s almost taken as a given that there will be violence. “It’s Veterans, what do you expect?” Dude, we’re Veterans, not felons, not lunatics. Really. I expect the same from them as they do from me: to be treated with respect and dignity. I’m a Veteran as well. I’d never “go off” on staff and threaten violence. Even after my TBI. Hell, now I’m more likely to back away from confrontation and figure out what approach to take later. Yes, violence should never be accepted in any setting. You are right … Veterans are not felons or lunatics and I have personal great appreciation for all Veterans for their commitment to serve in the military. With gratitude our Veterans all deserve excellent care and treatment, and they don’t get it either. Imagine what happens to Veterans if they commit these acts of violence while in the military…they would be convicted! I guess it’s acceptable behavior in society, but shouldn’t be! now this is a moving letter! This should never have been accepted! My gut is in knots just knowing part of what you must have gone through. you are a brave individual. I’m happy I wrote this letter and kept it. It gives me insight I would have otherwise forgotten, but also allows others to understand what happens in nursing and healthcare. It reminds me how dysfunctional things were…and doubtful they change much in healthcare. I would like to believe they have changed!